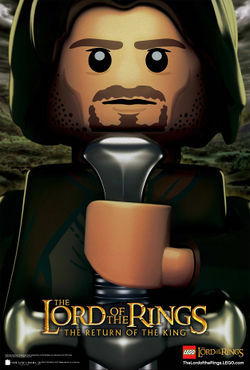 The Lord of the Rings: The Return of the King is a subtheme of The Lord of the Rings and the third book and movie in the trilogy. Sets based on it were released in June 2012. Long ago on one of Sméagol's birthdays, he and his cousin Déagol were fishing. Déagol found a big fish, but was pulled underwater. There, he found the One Ring. Afterwards, he swam up to the surface. Déagol looked at it for a few seconds until Sméagol showed up. Sméagol wanted it and strangled Déagol to his death. He was then exiled and went to the Misty Mountains and turned into Gollum. The movie then shows Frodo,Sam and Gollum heading for Mount Doom,with Gollum waking them up,telling them there's no time to lose. Meanwhile, Aragorn, Legolas, Gimli, Gandalf, Theoden, Gamling and Éomer meet up with Merry, Pippin and Treebeard at Isengard. The group returns to Edoras, where Pippin looks into a recovered Palantír, in which Sauron appears and invades his mind; Pippin tells him nothing regarding Frodo and the Ring. From this event, Gandalf deduces that Sauron is planning to attack Minas Tirith. Gandalf rides with Pippin to find Denethor, the Steward of Gondor, to whom Pippin swears his service. Gandalf urges Denethor to call Rohan for aid, but Denethor declines, fearing Aragorn and Gandalf plan to depose him. The Morgul army, led by the Nazgûl, drives the Gondorians out of Osgiliath. Denethor sends his son Faramir on a suicide mission to reclaim the city. Pippin lights a beacon, signaling Théoden and Aragorn to assemble the Rohirrim for battle. Elrond informs Aragorn that Arwen did not go to the Undying Lands, and is now dying. Believing their forces to be outnumbered by Sauron's, Elrond gives Aragorn the sword Andúril to acquire the service of the Army of the Dead, who owe allegiance to the heir of Isildur. Éowyn confesses her love for Aragorn and asks him not to go, but Aragorn reaffirms his love for Arwen and heads into battle. Accompanied by Legolas and Gimli, Aragorn ventures into the Paths of the Dead and gains the loyalty of the King of the Dead and his men by brandishing Andúril, proving himself the Heir of Isildur. At Dunharrow, Théoden rides off to war, unaware that Éowyn and Merry have secretly joined his forces. Sauron's armies lay siege to Minas Tirith, led by the Witch-king of Angmar. Believing a grievously wounded Faramir to be dead, Denethor tries to burn his son and himself alive, but Gandalf intervenes; he saves Faramir, but Denethor commits suicide by jumping off the tower. Just as the Gondorians are about to be overrun, the Rohirrim army arrives and counter-attacks in a massive cavalry charge led by Théoden. This shifts the tide of the battle, and the Orcs begin to retreat. However, the Haradrim arrive and join the Orc army, turning the tide. The Witch-king kills Théoden, only to be killed himself by Éowyn with help from Merry. On the verge of defeat, the Rohirrim are saved when Aragorn, Legolas, and Gimli arrive with the Army of the Dead and decimate Sauron's forces, ending the battle. Aragorn frees the Army of the Dead and their souls go to the afterlife. Meanwhile, Frodo Baggins, Samwise Gamgee and Gollum travel to Minas Morgul. Sam overhears Gollum's plans to murder them and take the Ring for himself. Gollum persuades Frodo that Sam wants the Ring for himself, and Frodo angrily tells Sam to go home. A heartbroken Sam leaves, but discovers Gollum's treachery and follows after them. Gollum betrays Frodo, leaving him in the lair of the giant spider Shelob, who paralyzes Frodo; moments later, however, Sam saves him. Gorbag and a group of Orcs capture Frodo and take him to Cirith Ungol. Sam rescues Frodo from the tower, and they continue the journey to Mount Doom. Aragorn leads his remaining men to the Black Gate of Mordor, distracting Sauron and his forces and allowing Sam and Frodo to enter Mount Doom. Sam carries the weakened Frodo up the volcano, but Gollum attacks them. At the Crack of Doom, Frodo succumbs to the Ring's power, refusing to destroy it. Gollum attacks Frodo and bites his finger off, seizing the Ring for himself. In the movie, An enraged Frodo attacks Gollum, and they both fall over the edge. At the last second, Frodo grabs onto the ledge, leaving Gollum to fall into the lava, taking the Ring with him. In the book, however, Gollum jumps up and down with the ring still around Frodo's finger, while the bleeding Frodo lies unable to move. Gollum leans pack to admire his precious, but accidentally steps over the edge, loses his footing and falls to his death, and that of the ring. As the Ring melts in the volcano, Sauron is destroyed along with Mordor. Frodo and Sam are saved from the rising lava by Eagles, led by Gandalf. In the aftermath, Aragorn is crowned King, heralding a new age of peace, and is reunited with Arwen and the four hobbits are bowed by all of Gondor for their courageous efforts. The four Hobbits return home to the Shire, where (after battling Saruman and reclaiming their land) Sam marries his childhood sweetheart, Rosie Cotton. A few years later, Frodo leaves Middle-earth for the Undying Lands with Gandalf, Bilbo, Elrond, Celeborn and Galadriel, leaving his account of their quest to Sam. Facts about "The Lord of the Rings: The Return of the King"
This page was last edited on 10 January 2016, at 00:48.